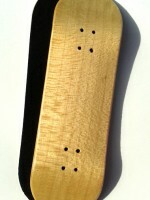 This Yellow Wood deck is high quality hand made in Portugal with 5 plies of exotic wood. It is 32mm wide, medium concave for 102 mm length. Perfect for beginners as for geeks of Fingerboarding, it gets medium kicks. This new board has a medium concave, not to high, not to flat, perfect for all beginners and technical riders also! 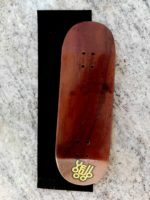 31 mm wide is conserving a realistic miniature skateboard aspect. This set up is already assembled with red trucks and white bearing wheels. You just have to place your rip tape and cut it as you feel.